Our starting point is across from a picturesque church, then along the road to the dirt trail. The majority of our ride is shaded under the thick tropical canopy. Our guides walk alongside our horses, which seems weird, but I am told this is the tradition. Along the way our guides point out the local plants, including coffee and cacao. We discuss the local roasting process and smell the cacao roasting nearby. There are buses that can take you to a lower trailhead for an easier ride along the river. We rode our horses along a pretty steep trail, but I did not realize how steep until halfway on our ride. I consider myself to be a pretty decent rider, for a city girl, but stirrups were not quite the right length and I was sore and bruised the next day from our ride. For less experienced riders, or kids, request one of the lower trails accessed by a short bus ride to the horses and lower trail near the river. Another option is to skip the horses and hike the entire 2+ kilometer trail. The steep trails are well shaded and would be a great morning hike. After our 40 minute ride we leave our horses to rest and begin the hiking portion of the journey. Initially, this is a light walk along the river to the final descent to the waterfall. The steps are the point of no return, if you are out of shape or worried about the descent (or subsequent ascent back up), then do not proceed. There are reportedly over 250 steps along this steep, muddy path that lead down 50 meters (165 feet) to the base of the waterfall. I did not actually count the steps to confirm, but I watched several people struggle to climb the steps back up. Know your limits and do not push yourself into injury. There is a little gift shop and rest area up at the top. Anyone that is not physically able to hike down to the waterfall can comfortably rest there. This is also a great spot to buy a water to hydrate before beginning the return trip. Due to lower than average rainfall, my guide shows me how low the water level is and explains that the waterfall is much smaller and more narrow than usual due to lack of rainfall. The river and ponds feed from the waterfall are normally much higher water levels and faster flowing river. Less water did not stop us from enjoying the natural fresh-water pool at the base of El Limon waterfall. After the horseback ride and hike, the 70 degrees F (21 C) water feels cool and refreshing. The rocks around the edge are a bit slippery, so water shoes are recommended but not absolutely necessary. A few people climb up the rocks for cliff jumping into the pool below. Our guides stay with us at the waterfall, offering to take photos and to keep our backpacks safe and dry while we swim. 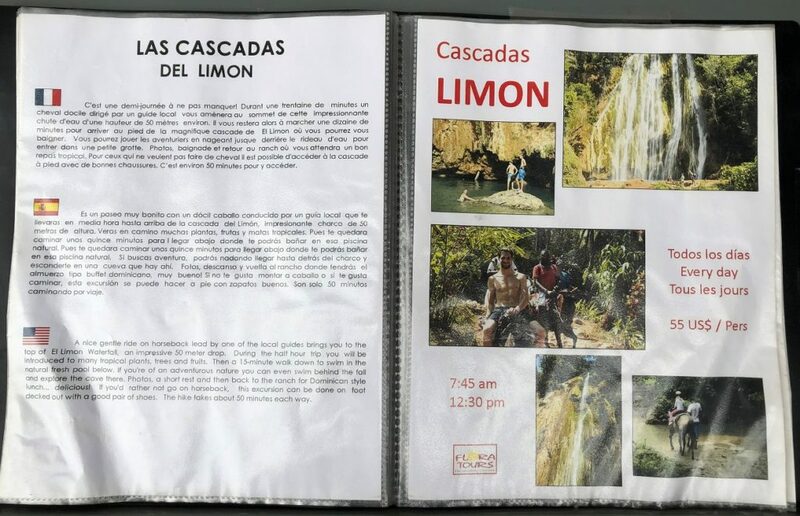 Cascada Limon is in Samana, Dominican Republic on the north side of the island. Located approximately 22 kilometers from the beach town of Las Terrenas. Plan for at least a 30 minute drive from Las Terrenas (if you know where you are going, add more time to get lost since there are literally no street signs). Most tours include horse ride, entrance fee to the waterfall, and lunch. The big difference in price is if the transportation from Las Terrenas is included or not. The cost of our tour, is 6,000 pesos ($12 USD). We were able to negotiate a lower price for three riders on a slow day in person, but could have also have been turned away if they were fully booked in high season. This price did not include transportation, or any additional booking fees from a third party. 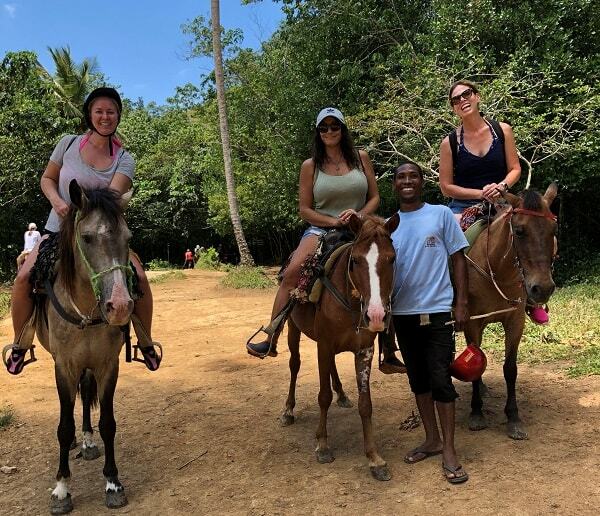 Horseback tours with lunch and transportation from Las Terrenas are priced between 22,500 – 32,500 pesos ($45-65 USD) per person. Booking online or arranging for pick up at the luxury resorts guarantees a “firm” price. You may be able to negotiate a lower price per person by arranging your tour at the Las Terrenas tour location in person. For solo travelers, I recommend the organized tour that includes transportation, it will end up begin less hassle and less expensive than arranging transportation for one. If you are traveling in a group, it may be less expensive to rent a car or arrange for transportation (ask for transportation options at the resort or hotel). For our group of 3, we saved about 10,000 pesos ($20 USD) per person by arranging for our transportation separately, but we wasted time waiting for transportation on both ends of the journey and it was not worth the minor cost savings to me. The entire tour of El Limon was 3 hours total. With transportation, plan to spend half the day on this excursion. 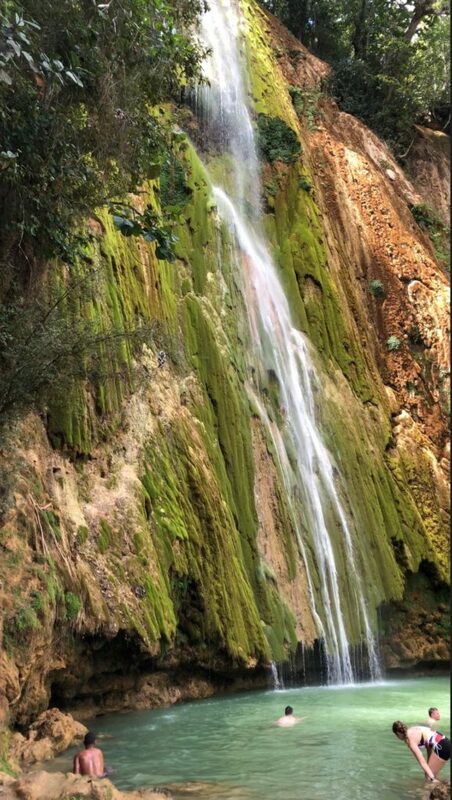 The horseback ride was 2.5 hours, including about 30 minutes at the El Limon waterfall and natural pools. Lunch was ready upon our arrival, so we enjoyed a leisurely lunch of only 30 minutes. Plus 30 minutes each way for transportation, and an additional 30 minutes waiting for return transportation (since we arranged this separately from the tour). 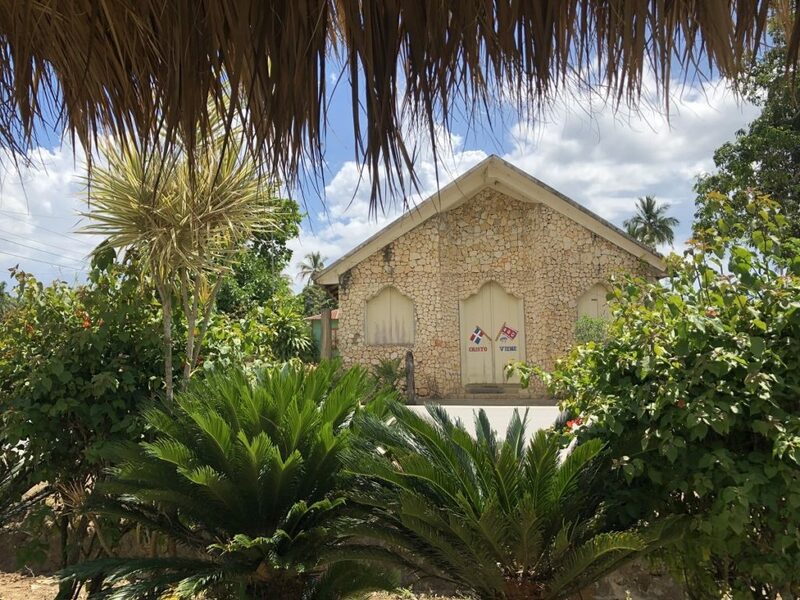 Our tour concluded with lunch consisting of fresh leafy green salad, locally sourced fruit salad, fried chicken strips, pork, and the traditional Dominican rice and beans. The chicken and port were moist and delicious. We were served “family style” of plenty of tasty food. After 2.5 hours on horseback and hiking, I was so hungry that I forgot to take a photo of the food. The large tour group that arrived for lunch as we were leaving had a full buffet set-up consisting of the same menu options from our lunch, prepared fresh upon their arrival. Since transportation was included in their tour, they ended up leaving before us, as soon as they finished eating. Each horse and rider has an assigned guide. More than just a tour guide leading us down the path, these guide are responsible for the safety and care of the horses and riders. The tour guides answered questions about the tropical plants, rainfall and weather patterns, and shared their knowledge about the island. They also offered to take photos, and even posed for a few photos with us. Guides are paid very little, if anything at all by the tour company. Their main source of income is tips from the ride. Plan to tip at least 5,000 pesos ($10 USD) or more if your tour guide goes above and beyond. A small backpack is the perfect horse riding accessory. My camera equipment and wallet stayed dry in my backpack, but I was glad to have my dry bag in case of rain. We brought towels with us, and I was completely dry from my swim after walking back up the trail to the horses. Our tour for El Limon began near a local Cigar Factory. While the horses were being saddled and prepared for our tour, there was a cigar making demonstration. Even as a non-smoker, it was fascinating to watch how cigars are made. Our demonstration included cutting the tobacco leaf free-hand and watching the cigar rolling process. Dominican Republic is famous for hand rolled cigars. These Cigars gained popularity with Americans as a legal alternative to Cuban cigars. I have several cigar smoking friends, and I regret not buying a box of these hand rolled Dominican cigars as gifts. I purposefully did not bring much cash with me for the horse ride, not realizing that I would find such unique souvenirs for a waterfall tour. I will definitely bring more cash with me for unique souvenirs like this in future visits to DR. The pool at the bottom of the waterfall still looked pretty good to me in spite of the drought! I’m glad you included the tip for non-experienced riders. I’d probably opt for a bus honestly! This is such a wonderful adventure. I am not really great with horse so, we might consider the hiking instead in case we get to visit. It is good to know that the trails are well-shaded. Will take a look at the tour options too. Happy to know they serve good food. Looks like such an amazing adventure. 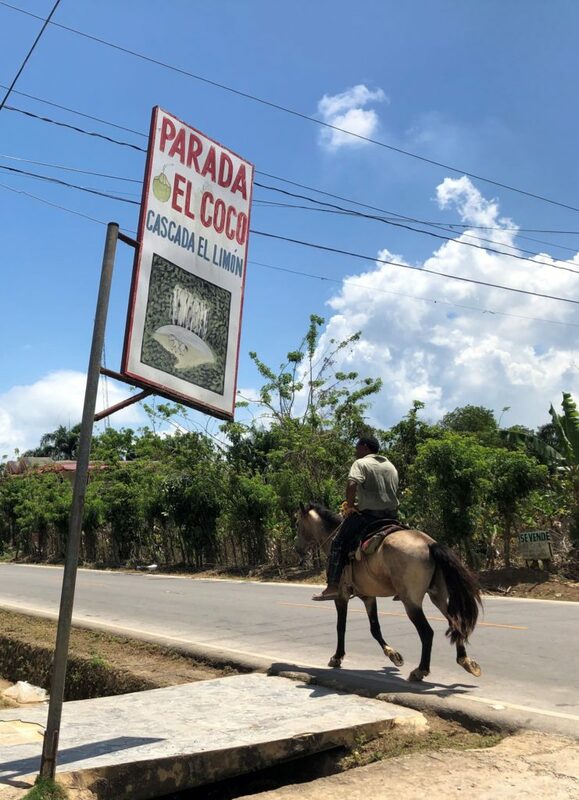 First the cigar experience then the 3 hour on the horseback, and then finally the waterfall – recipe for a perfect day in the outdoors. Btw can tis be done on foot as well, without using the horses? There were only a few hikers, but with proper hiking shoes this would be a great hike! The Dominican Republic is on our list of places to go. We’re always looking for different ways to get somewhere popular so I like the option to ride horses or hike. I also appreciate the tip that while you may save money, you lose time arranging for transportation yourself. How cool to watch them making cigars too! El Limon waterfall is an absolute must-see in DR. I hope you get to visit soon! I wouldn’t feel weird, but rather safe if they walk alongside the horse. You know, being a novice & all… Haha… But then, I think I’d rather hike to be on a safety side! 21°C sounds perfect for a nice cool dip! Hand rolled Dominican cigars? That’s a perfect gift indeed! The water was perfect! The cigars would be such a good gift, next time I need to bring more cash. I love to chase waterfalls and this looks like a good one! I’m hoping to be able to make it down south next summer and need to put the DR on my to-do list! Thanks for the heads-up recommendation for the benefits of going with a group. I tend to travel solo a lot and am usually wary about guided tours. I can definitely see the benefit though! The individual guides really made this feel like a private tour. I think you will like it! I enjoyed reading your post, it sounds like you had a great day. I really like the idea of combining the horse ride and visit to the waterfall. Despite their being less rainfall, it looked a beautiful spot and I expect a perfect place to cool off! It was handy to have an idea of how much to expect to pay for the tour, transport and tipping. It was a fantastic experience, I hope you get to see it for yourself! 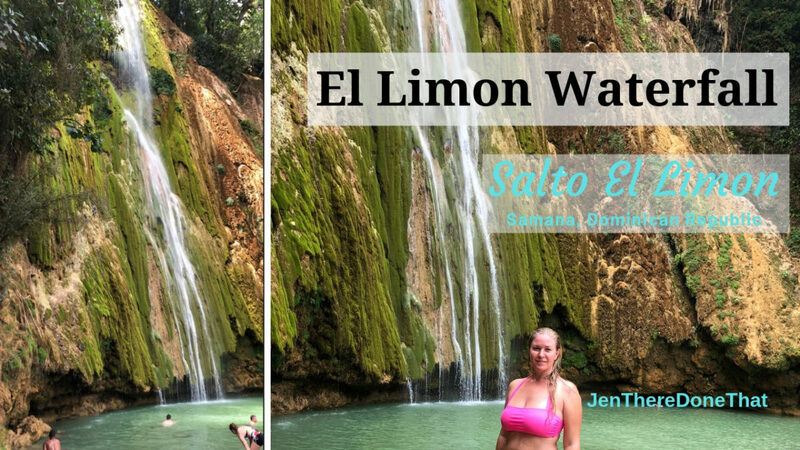 Loved reading about your adventure at El Limon Waterfall. Sorry to know that the horse ride was not all that comfortable. We would generally prefer hiking than a horse ride on a treacherous terrain. Do guides accompany the hikers, as well? I should not have galloped my horse, being sore was completely my fault. Hiking would be great, too. I would still want a guide, since there are no trail markers and it would be too easy to get lost. Dominican Republic is a beautiful country, in the Caribbean. Definitely worth visiting.